In a world crowded with pumped up gurus selling low-value info products, The 6 Week AMC stands alone as the ultimate walkthrough to affiliate marketing. Students of the 6WAMC can expect 6 weeks of hyper relevant, step-by-step video instruction, delivering all the foundational elements of affiliate media buying, including competitive research, offer evaluation, tech setup, and advanced optimization techniques. Each unit comes with up-to-the-minute case studies showing how our tactics drive results. We know that when learning a new skill, an unanswered question at the wrong time can derail your momentum and affect your motivation. That’s why our AMC experts are there to answer your questions in real-time. 6WAMC’s support connects students with our team of affiliate marketing experts in a live chatting environment. Our teachers have been part of our community for years and each is dedicated to the notion that anyone with a work ethic and a passion for marketing can master the skills necessary to make a very good living with Affiliate Marketing. These All-Star Acceleration Modules close out the 6 Week AMC, providing students who’ve mastered the foundations of affiliate media buying the opportunity to “choose their own adventure.” Each All-Star Module provides an exciting option to accelerate their affiliate marketing career. We teach you through video. We meet you face to face and talk you through the ins and outs of affiliate marketing. Multiple course coordinators help guide you to success, and representatives from select partners also provide exclusive support. We even do live Q&A sessions on the weekend where you can ask ask coordinators your burning questions, live, and have them answer on camera. To help you get started we have carefully selected partner traffic sources to launch campaigns with and these provide $2000+ in bonus ad credit. Awesome! Mr Green? Charles Ngo? Tim Tetra? 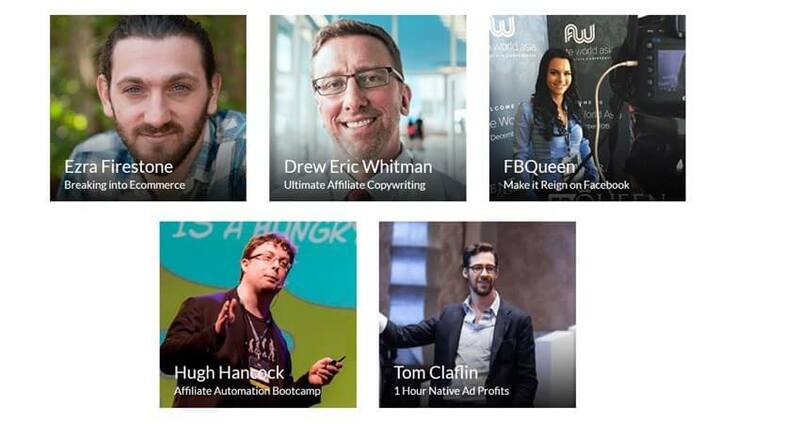 We have interviews, Q&A and even video case studies from some of the best marketers you know. As a 6 Week AMC participant you get streamlined entry into traffic sources and affiliate networks, as well as prioritized support and approvals. Introduction to course, AMC platform, sponsors and platforms we will be using. Verticals and offer types. Compliance in verticals. Bidding modes and commission models. The affiliate marketer’s tool kit.